Also serving communities of Pamplico. There are 10 Assisted Living Facilities in the Florence area, with 6 in Florence and 4 nearby. The average cost of assisted living in Florence is $3,590 per month. This is higher than the national median of $3,346. Cheaper nearby regions include Hartsville with an average starting cost of $3,357. To help you with your search, browse the 31 reviews below for assisted living facilities in Florence. On average, consumers rate assisted living in Florence 4.1 out of 5 stars. Better rated regions include Hartsville with an average rating of 4.7 out of 5 stars. A wealth of arts and culture and proximity to Myrtle Beach helped propel Florence to the number three spot on Money’s list of 10 Best Places for Single Seniors to Retire. With 15.8 percent of the city’s current population aged 65 years or older, there is a bustling senior scene in Florence. There are 15 assisted living facilities in the Florence area for seniors who are mostly independent but who require moderate assistance with daily tasks. 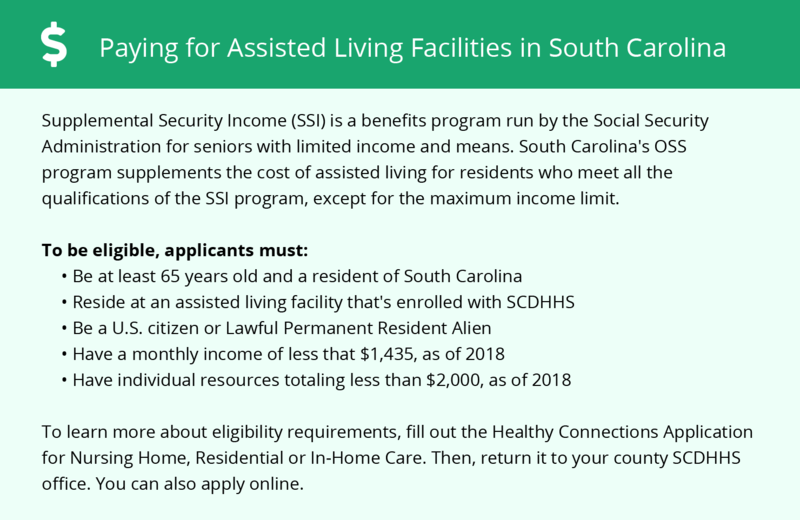 These long-term care residences, known throughout the state as community residential care facilities (CRCFs), are licensed by South Carolina’s Department of Health and Environmental Control, Division of Health Licensing. Florence offers seniors an affordable place to live, with an overall cost of living 11 points lower than the national average. Seniors wary of long, cold winters will likely appreciate Florence’s January low of 33 degrees Fahrenheit and the city’s solitary inch of snow per year, but winters are hot and humid, making it more difficult to get out and about comfortably. The violent crime rate in Florence is more than double that of South Carolina as a whole. Locals have a one in 13 chance of being the victim of a property-based or violent crime, making Florence one of the more dangerous places for seniors to live. The Pee Dee Regional Transportation Authority (PDRTA) connects Florence to cities such as Lake City, Darlington, Scranton and even Myrtle Beach across Darlington, Florence and Marion counties. Senior citizens aged 65 or older may purchase half-price tickets, and every vehicle in the PDRTA is wheelchair accessible. The Florence area is home to world-class medical facilities, including Carolinas Hospital System and McLeod Regional Medical Center, in the event of medical emergencies or illness. Florence has an array of community resources for seniors, including the Senior Citizens Association in Florence County, which offers services such as group dining and crisis management, as well as at least two senior centers. Assisted Living costs in Florence start around $3,590 per month on average, while the nationwide average cost of assisted living is $4,000 per month, according to the latest figures from Genworth’s Cost of Care Survey. 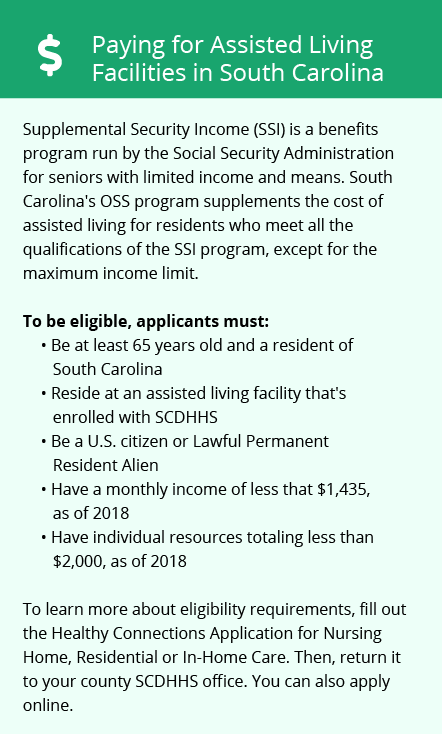 South Carolina has few state-sponsored options aimed at low-income seniors looking for financial assistance for long-term care. For seniors interested in assisted living, Medicaid offers the Community Long Term Care (CLTC) waiver, a program overseen by the South Carolina Department of Health and Human Services that helps residents facing nursing home placement explore alternative options for personal care, medical care and living arrangements. To see a list of free assisted living resources in Florence, please visit our Assisted Living in South Carolina page. Florence-area assisted living communities must adhere to the comprehensive set of state laws and regulations that all assisted living communities in South Carolina are required to follow. Visit our Assisted Living in South Carolina page for more information about these laws.